Never release the throttle when you turn the handle bars as you try to avoid a hurdle that is on your path. 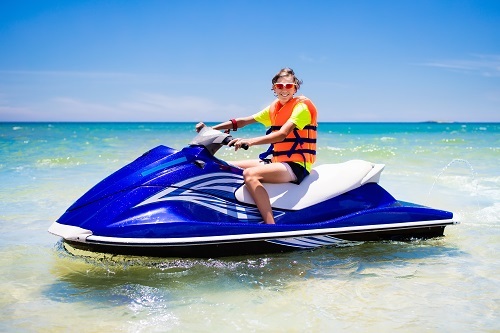 Your jet ski rentals turn by propulsion thrust and that means if you release the throttle, your water craft will not be changing its direction and might even keep on moving towards the very obstacle that you are trying to avoid. When this happens, you should give the WaveRunner sufficient gas to let you swiftly change where you are heading and avoid the obstacle. If you are riding a PWC, you need to make sure that everything around you is safe. Also, you need to look out for other PWCs and boats that may be near you. In case you change your direction suddenly, you may wind up running into other PWCs that are traveling behind you. If you change directions, you have to look left and right first and make sure that everything is safe before you turn the craft. If other PWCs are riding along with you, don’t forget to maintain a safe distance in every direction between your craft and the others. If you are too close to another craft, you could end up hitting another water vehicle especially if that other PWC change its direction. You may also hit someone in case they fall of the water craft. What do you need to do if in case your passenger falls off the jet ski rental? You have to run to him or her right away. As soon as that person falls off the water craft, you have to release the throttle right away and never leave him or her out of your sight. Be sure to be on the downwind side when you approach him or her. Once you reach him or her, turn off the engine and pull him or her back into the water vehicle. In case your watercraft flips over, you have to turn off the engine right away. Move around to the rear of the water vehicle. When you turn the WaveRunner upright, turn it clockwise since the engine carburetor is found on the right part of the WaveRunner. Get back onto the water vehicle, put both your hands on the foot well floor and try to pull yourself up. Put your knees on the floor and try to keep your balance while you are trying to pull yourself onto the water craft. Apart from exceeding customer expectations, we also want our clients to be safe at all times. In Action Water Sportz, jet ski rentals will always have a guide for safety. If you are all set for some adrenaline filled jet ski adventure, be sure to book our Myrtle Beach Jet ski rentals now. Call Action Water Sportz if you are looking for jet ski rentals in Myrtle Beach.